Razor-E offers great user benefit and gives superior comfort to the operator. 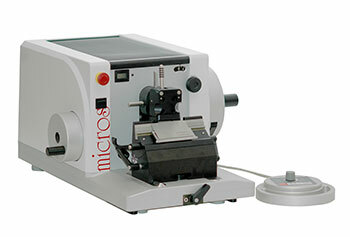 The perfectly ergonomic arrangement of the control elements enable effortless handling of the microtome. Section thickness can be adjusted between 0.5 µm – 60 µm and the automatic trimming in 3 steps: 1:10 µm, 2:20 µm, 3:30 µm. The automatic mode simplifies the technical difficulties of sectioning and reduces the operator labor intensity making work more efficient. A change between these two modes can also be quickly done.